Our solid real wood bathroom vanities are available in many sizes, styles, and finishes – with options that are hand built to blend into your existing rustic décor while satisfying your everyday needs. Additional features to consider include sink placement (ex: centered or offset), number of cabinets, drawers and sink dimensions. Ask about our line of copper and stone sinks today!. Our standard depth is 22.5”, and our standard height is 35.25” but if you need your vanity made in other dimensions, it can be ordered to your exact length, width or height. 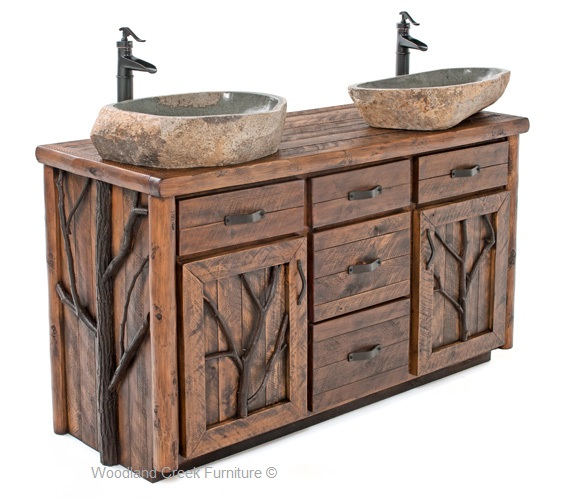 Our Rustic Log Vanities can also be ordered in a variety of colors. Our expert finishers have developed several trendy colors to fit today’s popular color trends. You may select from Clear, American Chestnut, Honey Amber, Barnwood Lager, or Contempo. Our Rustic Log Vanities looks great in any of the finish options. You will have a difficult choice picking the one you like best. Matching medicine cabinets and linen cabinets are also available in desired sizes.